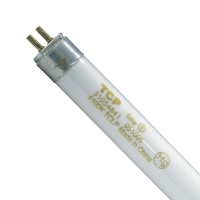 This T5 fluorescent lamp from TCP lighting is powered using 54 watts of energy. It has a high output of 5,000 lumens. The 5000K color temperature provides a daylight white light. With a lifetime rating of 24,000 hours, this bulb also eliminates the need for frequent replacement. It has a 2-year warranty from TCP. The T5 fluorescent measures 45.2 inches in length, 0.63 inches in diameter.